The AlienBee line of studio strobes from Paul C. Buff of Nashville, Tennessee has been a favorite of studio and location photographers for some years. 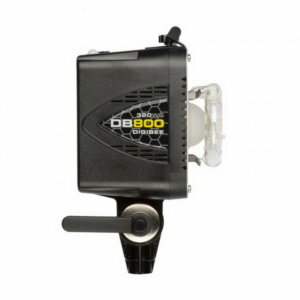 Anyone desiring a compact and extremely reliable strobe with a very compact form factor will do well with an AlienBee strobe unit. DigiBee strobes are the newest offering from Paul C. Buff, and they are a nice step forward in regards to size and usability. DigiBee DB400 and DB800 are 160Ws and 320Ws studio strobes. While AlienBee strobes were already compact, these are even smaller. One of the changes that extended their usability is the change to LEDs for modeling lights. While most modeling lights are adequate for accurately previewing lighting effects, these LEDs are bright enough to be used as a continuous light source. Digital SLRs and mirrorless cameras from the major brands tend to have outstanding video capabilities, a situation that continues to improve. For best results, video recordings need good lighting, just like still image photography. A clean, bright continuous light source means better color rendition and higher quality video recordings. DB400 and DB800 LED modeling lights have a CRI of about 90, a color temp near 5200K, and an apparent brightness of a 400W bulb. There are more powerful video lights out there, but this dual-use capability of the DigiBees is great for DSLR and mirrorless users. AlienBee studio strobes are smaller on average than many other brands. DigiBee strobes are even smaller, as well as being lightweight. Size of strobes used in a studio may not seem like a big deal since we usually use them in a complete lighting set up that includes background systems, tripods, light modifiers, and other items. What makes the smaller size and weight a good feature is seen in use. A light stand can get a little wobbly when extended to full height with a strobe mounted. Adding a light modifier such as a softbox or umbrella also adds to the weight and possible instability issues. If the strobe itself has less weight to start with, then that issue is lessened. Portability is also enhanced by being smaller than average. On those occasions that a photographer needs to take studio equipment to an on location photoshoot, being easily portable helps out quite a bit. The DigiBee strobes pack up well and set up quickly with all the necessary accessories. 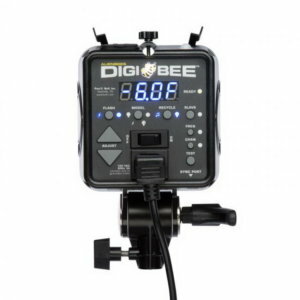 Besides being a seamless fit with current digital cameras, the DigiBee strobes are digital in the way they are set up and operated. There are no knobs with pointers to adjust power settings or access other features. Adjustments are made with buttons and seen on a digital display on the back of the unit. Flash mode, power level, modeling light, slave control are all adjusted with a variety of buttons that are used as a fairly shallow menu. There really isn’t too much to change, so using the buttons and the instant feedback of the large and bright digital display makes using the DigiBee simple and direct. Other feedback is given by ready lights, confirmation lights, and an audible tone. 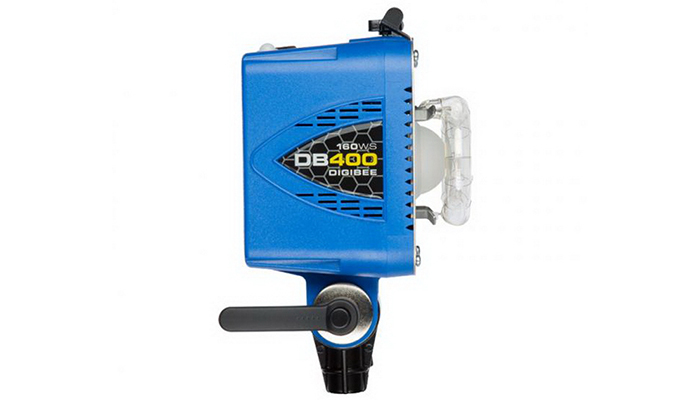 The DigiBee DB400 has a power output of 160Ws, the DB800 has an output of 320Ws. Power levels are adjustable in a 7 f-stop range, discretely variable in 1/10th f-stop increments from full to 1/64th power. Recycle time is under a second to a full second, depending on power level. The flash tube is daylight balanced, so minimal color correction would be needed in post-processing. Tubes are designed to be long-lived and rather durable. Certainly, you don’t want to drop your DigiBee, but regular heavy use will not damage the flash tube unless you happen to be so unlucky as to have your drop or fall impact directly on the tube. If that does happen, the famed customer service of the Paul C. Buff Co. is absolutely top notch. Replacement flash tubes and mounting hardware are quick turnaround fixes. Modeling lamp is a 75W LED bulb, the equivalent of a 400W incandescent. A CRI of 90 makes this LED lamp a good choice for use as a continuous light source for live action recording. This dual usage is one of the better new features that sets this strobe apart from other similar units. 400 watts is bright enough for most close to the subject lamp positions. Very handy for studio jobs that ask for stills and video clips of the same subject. Flash synch is accomplished with a flash cord or by means of a slave. A 15 foot PC cord and a 15-foot power cord are included. A built-in fan keeps the strobe cool during long operation, even with the modeling light on or with a softbox mounted. Three things stand out as being not so perfect with the DigiBee strobes. Wireless radio operation is not built into the unit, you have to connect by means of a port for a wireless radio slave or trigger. With the proper accessory, radio operation can be slave or the primary trigger. The optical slave is built in on top of the strobe and works just fine. The cooling fan adds noise to video recordings. It’s not terribly loud, but it can be distracting if the lamps are placed too close to the recording camera. After a few drops, the fans tend to rattle a bit, too. Front mounted accessory light modifiers are a little fiddly to mount and unmount. If you use too much force, sometimes the plastic pieces can snap off. AlienBee strobes are a favorite of many studio and location photographers, the DigiBee will likely continue to please photographers. Especially with the bright and color correct modeling lamp that lets you get double use out of these compact strobes. Extremely compact, easy to see digital display for controls, and dual usage lighting makes the DigiBee DB400 and DB800 an easy choice for professional and other serious photographers.